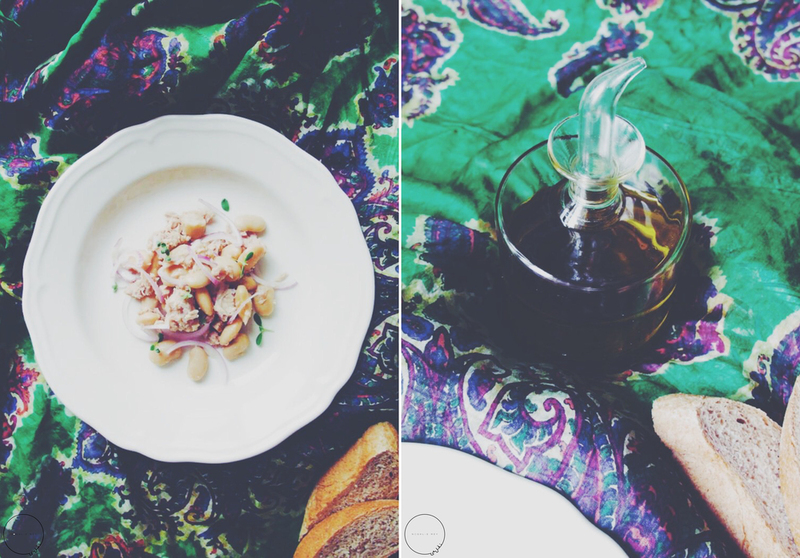 The classic Tuscan tuna & white bean, "Tonno e Fagioli" now is a popular International dish. Very tasty and simple to prepare, in Italy they serve it on top of the hot and crispy old bread as an Antipasto. You can find it anywhere, local bars use it for a aperitivo instead in restaurants you will find it as a proper dish serve as an Antipasto. I love it for a quick lunch or a tasty mezze for parties too. I added some fresh Marjoram to give it an Iranian twist, unfortunately there is no Dark opal basil in Italy but if you could find some it will be a perfect herb choice for this lovely Italian dish. The beans in the picture are Fagioli Spagna. At the end you can use your favorite type of white beans if you can not find the Italian one. Use sweet red onion if you can find any. Use a lot of good extra virgin olive oil which is the key to delicious Italian dishes. Toast the bread. Meanwhile rinse the cannellini beans with cold water and let them dry out a little bit. Chop the onion finely and place them in a bowl together with tuna and season them with salt, pepper & lemon. Add the beans to the tuna mixture, mix well. Drizzle the salad with extra virgin olive oil, some more seasoning if needed and serve it on hot crispy bread. Enjoy!